Holding the iCloth flat, wipe your iPhone surface from top to bottom in a straight downward motion, this will clean all the dirt, grease, and grime off your screen. Flip the wipe, repeat as necessary. Our purified water-based formula includes some isopropyl alcohol, which is safe for use on all screens. We have done extensive testing and research on the chemical resistance of the materials our products are used on. We do not use ethyl alcohol, which can be very dangerous on plastics or coatings. Visit our website for more detailed information. 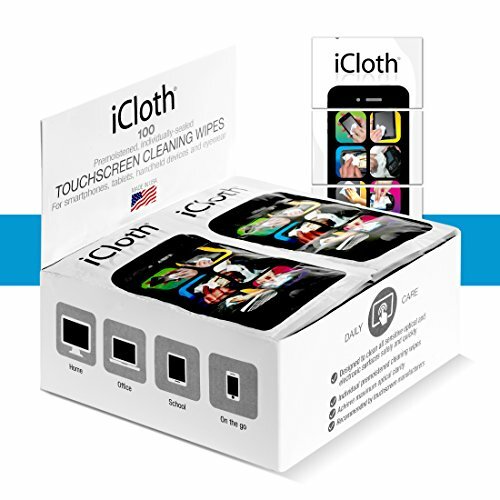 Keep Your Screens Clean with iCloth Wipes! You'll buy a quality product made with pride & care in the USA, and you'll activate iCloth's "Empty-box Guarantee": Your satisfaction with every wipe in the box. Guaranteed. You're looking for details? iCloth features: One-step screen wipe is individually pouched for maximum convenience /Custom-sized & pre-moistened for a consistent clean every time/Repels oil & grease - screens stay cleaner longer/Safe water-based formula + isopropyl alcohol + proprietary ingredients/Meets rigorous avionics, military & healthcare specifications/The right size for the right job: Available in regular, large and extra-large/Issues or Questions? Reach out! We care. If you have any questions about this product by iCloth, contact us by completing and submitting the form below. If you are looking for a specif part number, please include it with your message.